Finally, rib-eye steak that’s made with Lawry’s aged prime rib. As with many things in the food world, cuts of meat fall in and out of fashion. For 75 years, Lawry’s The Prime Rib on La Cienega’s Restaurant Row has focused on serving prime rib, roasted and sliced to order. (The restaurant has, in the intervening years, also introduced seafood and vegetarian dishes.) Next month, for the first time in 20 years, the restaurant is introducing a major new menu item: rib-eye steak. Now, if you know your cuts of meat, this isn’t really all that different from prime rib. The ribe-eye is a steak that is cut from the rib portion of a side of beef and then cooked. It is usually broiled or grilled. The prime rib, on the other hand, is the same cut of meat, but is instead roasted whole and then sliced to order. CEO and President Richard Frank says that the company thought long and hard about this move. 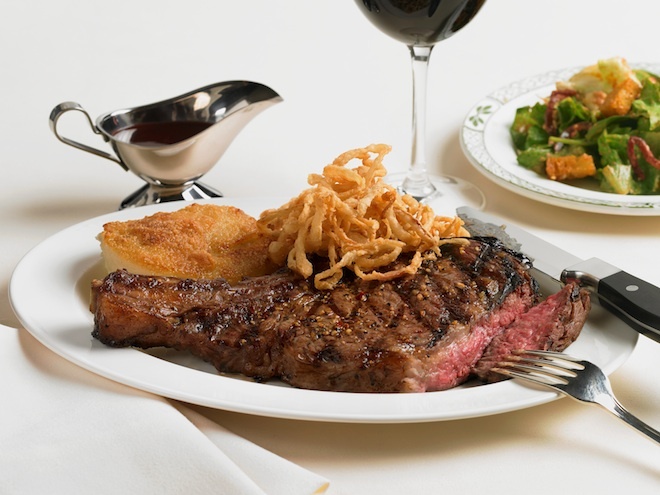 While the Lawry’s location in Chicago has had many requests for steaks like a rib-eye, the prime rib remains the most popular item at Lawry’s worldwide. But when they decided to introduce The Lawry’s Ribeye, they thought about everything from how to spell the name (rib-eye verses ribeye verses rib eye) to the type of bandsaw to buy (with which to slice the meat) to the type of grill (to sear it upon; they ended up with one that reaches 700 degrees). Executive chef and VP Ryan Wilson is in charge of training kitchen staff on the Ribeye’s preparation. He developed a special basting butter that each rib-eye gets before it goes out to the dining room. It’s a combination of butter, rendered beef fat, and Lawry’s au jus that is brushed onto each steak. Prior to cooking, the steak is also seasoned Montreal-style, with garlic, onion, salt, black pepper, red chili pepper flakes, and (of course) Lawry’s seasoning salt. Available to the public on August 6, Lawry’s Ribeye (a 12 oz. cut will be on offer for $46; 24 oz. for $54) will be served with scalloped potatoes and crispy, fried onions. As with all other Lawry’s meals, the entree comes with Lawry’s spinning salad. It’s like dinner and a show. Previous articleCityDig: Is This 19th-Century L.A.’s Most Eccentric House?